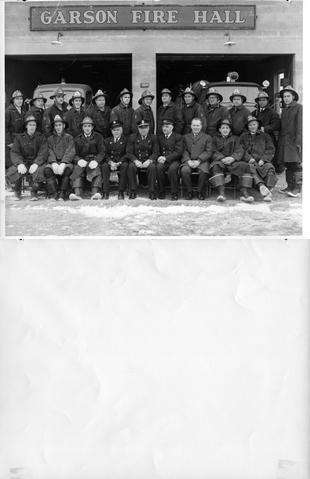 One photograph of the Garson Fire Department in front of the Garson Fire Hall. Seated in the front row from left to right are L.A. Butler, Gus Della Vedova, J.J. Archabald, Uno Kreko, Orlando Rinaldi, Jack Heit, Stan Hayduk, Hugh MacGillvray, and Sam Gillis. Standing in the back row from left to right are L.R. Erwin McAlinden, Gordon Hollard, Danny Kerrel, Ed Laliberte, George Cleroux, Lawrence McKerral, Emil LaJoie, L. Doolan, Klive Hembruff, Marty Tall, Paul Cleroux, Joe Lee, and F. Kehoe.